Who will win the 2010 Kentucky Derby? On Wednesday at noon, final entries were taken and post positions were drawn for the 136th running of the $2 million Kentucky Derby (G1). A full field of 20 three-year-olds will go 1 1/4 miles on Saturday at Churchill Downs. 22 horses were entered, with Pleasant Prince and Setsuko being eliminated due to insufficient graded stakes earnings. Unlike the "draft draw" held the last few years, Churchill Downs reverted back to the traditional double-blind draw for this year's running. 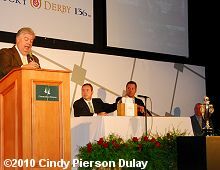 John Asher hosted the proceedings, with racing secretary Ben Huffman drawing the entry sheets and assistant secretary Dan Bourque drawing the numbers. Asher pointed out that Huffman shuffled the entry sheets, a reference to some years when this was not done and the names came out in alphabetical order. After the numbers were drawn, handicapper Mike Battaglia announced the morning line, saying that despite the post positions he did not make any changes. 3-1 favorite Lookin at Lucky, an unlucky third in a troubled trip in the Santa Anita Derby, will break from the rail under jockey Garrett Gomez for trainer Bob Baffert. Santa Anita Derby winner Sidney's Candy is the 5-1 second choice, but he drew the far outside post 20 for trainer John Sadler and jockey Joe Talamo. Three horses are tied at 10-1 third choice, Ice Box in post 2, filly Devil May Care in post 11, and Awesome Act in post 16. Two equipment changes were announced: Lookin at Lucky will race with blinkers off, while Devil May Care will race with blinkers on. Below is the field listed in post position order with morning line odds. Be sure to click the link on each horse's name to view full info, stats, and a photo where available. A star next to the dosage index indicates a dual qualifier. The Kentucky Derby will be televised on NBC from 4-7:00pm EDT but you can watch most of the Derby card on ESPN from 1-5:00pm. Both networks will broadcast in HD this year. Free past performances for the Kentucky Derby and Kentucky Oaks are available from Daily Racing Form. The Kentucky Derby goes off at 6:24pm ET, carded as Race 11 of a 13-race card on Saturday May 1st. Tuesday Kentucky Derby and Oaks workouts - It was a dreary, wet morning at Churchill Downs but still 9 Derby and 9 Oaks horses came out during their exclusive workout time, with two having timed works. Check out photos and comments here. New! 14 entered in the 2010 Kentucky Oaks - It will be a full field on Friday, barring any late scratches, with Blind Luck the heavy favorite at 6-5 on the morning line. Get the post positions, odds, and free past performances here. New! Analyzing the Top Derby Contenders - My annual analysis of the top contenders to try and select a winner by matching each to the profile of a Kentucky Derby winner using many of the more popular angles and statistical trends. New! Free past performances - from Daily Racing Form for all the top contenders New! Derby Contender Graded Stakes Earnings - ranks the top contenders by graded earnings. This is what determines who can get in the starting gate on Derby day. Includes earnings through 4/17. Updated! Review: Churchill Downs - America's Most Historic Racetrack by Kimberly Gatto. An entertaining and informative account of the history of the track and it's most famous race, the Kentucky Derby, with lots of photos. Definitely recommended. New! Review: Triple Crown Handicapper 2010 - by Jim Mazur. Includes lots of stats for all 3 races and explains how to use a system of statistically derived negative angles to eliminate the "bad" picks. New! Derby prep race PPs - free from DRF, usually up the day before the race. Also has charts and video afterwards. 2010 Triple Crown Late Nominations - Only six more thoroughbreds were made eligible for the three Triple Crown races for a fee of $6000 by the late nomination deadline. Any not nominated now will have to pay a huge supplement fee to enter. Check out the list here. 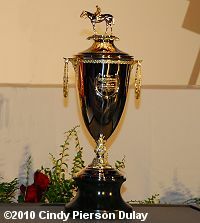 2010 Triple Crown Nominations - 366 horses were nominated by the January 16 early deadline. Experimental Free Handicap - Ranks the top 2-year-olds for 2009 and determines the dual qualifiers for the 2010 Kentucky Derby. Triple Crown Trail - 2010 prep race schedule with results updated weekly. Kentucky Derby Future Wager - There will again be three future wager pools for the Derby on February 12-14, March 5-7, and March 26-28. There will be a single pool for the Oaks on March 5-7. 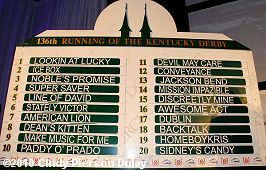 Kentucky Derby Future Wager Pool 3 - The third and final pool for the 2010 Kentucky Derby Future Wager is now closed and with so many upsets this weekend the field is favorite at 5-2 for the first time ever in Pool 3. 2-year-old champion Lookin at Lucky is a narrow second choice also at 5-2. Get all the horses, final odds, and past performances here. Kentucky Derby Future Wager Pool 2 - Wagering is now closed for Pool 2 and once again the field was the favorite at 3-1 with Eskendereya next at 5-1. In the Oaks Future, Blind Luck was the favorite at 4-1. Get the horses, final odds, and free past performances here. Kentucky Derby Future Wager Pool 1 - Wagering is now closed and the field wound up as the 3-2 favorite with Looking At Lucky next at 8-1. Get the horses, odds, and free past performances here. Review: Kentucky Derby Greatest Moments - Commemorative DVD from Churchill Downs. A great new DVD with video from 27 different runnings along with interviews, photos, and historical info. Definitely recommended for any racing fan! Thoroughbred Times Road to the Triple Crown - contenders, news, stats, and more. 2009 Triple Crown Recap - all 2009 Kentucky Derby, Preakness, and Belmont articles including results and photos for all 3 races.